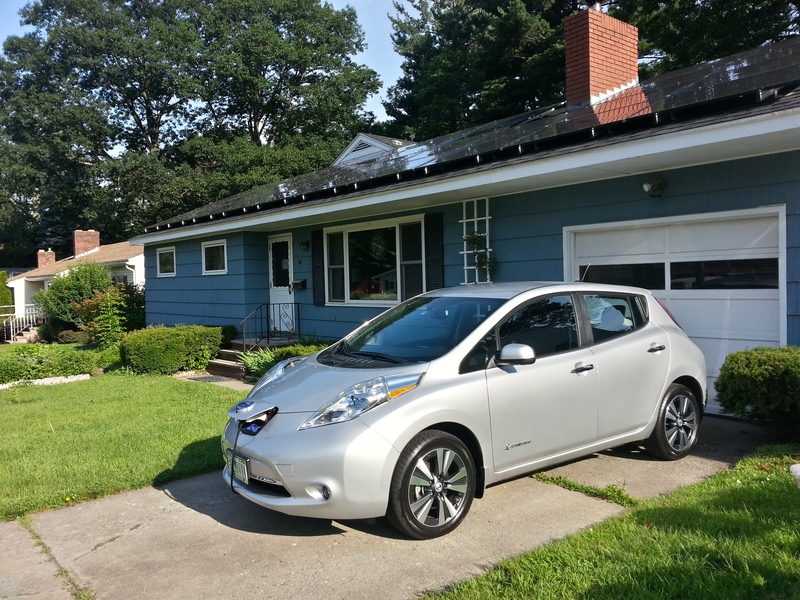 I drove home in a shiny new Nissan Leaf last night. This, so-called, zero-emissions vehicle has no internal combustion engine, just a 80kW electric motor and a whole lot of lithium ion batteries. It seats 5 and drives like the Celica we had before kids…only quieter…a lot quieter! This will be our around-town vehicle since it has a max range of about 100 miles. It gets roughly 3 miles per kilowatt-hour. Our lease allows for 12k miles per year. Unlikely that we will drive it that far but even if we did, that would only add about 4-5000 kilowatt-hour to our annual energy budget. Even if we bought all of that from the utility at a peak rate (obviously we won’t) it would cost us about $750 to operate. The vehicle has its own internet connection and I can monitor and control it right from my phone. I’m pretty geeked. Congratulations on your brand new clean earth ride! Keep us posted as you learn more–it’s very exciting. How about a unique bumper sticker so we know it’s you? So cool, Nik & LL! Can you explain more about how you can control the engine from your phone? Thanks, Jess! There’s no engine, just an electric motor. And I can’t control the motor from my phone, just climate system and charging status. For example, I can turn on the A/C or heater from the comfort of my bed so the car is just as comfortable when I’m ready to get in it. Also I can tell it to start or stop charging the battery in order to take advantage of off-peak electric rates, for example. congratulations, good way to solve your excess electricity production…. Still very cool, Nik. Next you will need a flying car! Yeah, solar powered flying cars! Sweet! How are you liking it so far? Are you charging this entirely from the panels? Also, follow up on your $750 bucks. Is that an estimation of what you’d pay for the lifetime of the lease? If you didn’t have solar panels to charge, how would this compare overall to the same type of gas powered car, financially? I like driving the Leaf. It is very sporty but my favorite part is how quiet it is. At low speeds it emits a whirring sound to alert pedestrians and animals. It sounds like a hover craft from the future! We usually charge it at night. I haven’t installed the quick charger yet so it takes about 12 hours to charge on the trickle charger. Sometimes we use the public charging stations in downtown when we’re there doing errands. Those are free to use (for now) but they are often occupied. I was delighted to find a new charging station in Vergennes (about 20 miles away) when I was down there for a baseball game recently. I had just enough time to get a full charge while I sat and watched Kuochuan play. That charging station was not free, it cost $1.50 for a full charge. When was the last time you filled up your car for $1.50?! The $750 amount was per year. Compared to a similar gas-powered car that gets 30 miles per gallon, you would pay about $1,500 per year at $3.75 per gallon. Cold weather has eaten into our range. When we start ‘er up the dashboard tells us how charged up the car is and how many miles we can expect out of that charge. Lately, in really cold weather (sheesh, it’s been cold in Vermont this month! ), the range has dropped into the 50’s (miles) from a high in the upper 90’s during nice weather. Nik might be able to chime in on what the batteries are doing when it’s very cold out. But a good part of the reduced range is the climate control in the car. Perhaps it sounds strange, but the Leaf has the most luxurious climate control system I’ve ever experienced. Heated seats… Heck yeah, in the back! Heated steering wheel… yeah baby, nearly burns my hands (I guess you’re supposed to be wearing mittens?) And of course all of that can be remotely controlled from my desk or on my phone. When I’m really on my game, I set the timer the night before to heat up the car 30 minutes before I plan to drive away in the morning. 30 minutes? Yeah, there’s a thermostat in the car, so when it comes up to temperature in the cabin the climate control throttles back. And besides, I’m plugged in to grid power at that point, so it’s not reducing my range. When I’m not plugged in I don’t turn on the climate control before I get in the car – just too indulgent.